Learn why bicarbonate – the natural taste enhancer – gives Gerolsteiner its clean and refreshing taste. Bicarbonate (hydrogen carbonate) is not a mineral, but a component of the salts of carbonic acid. HCO3- is its chemical formula. Your body produces bicarbonate. Bicarbonate has an acid-neutralising effect and balances the taste of carbonic acid. Unlike many essential nutrients, for example, calcium and magnesium, your body can generate bicarbonate, but generally in insufficient amounts for optimum health and wellness. There is no recommended daily allowance. Bicarbonate, also known as hydrogen carbonate, is responsible for maintaining the balance of acids and bases in your body, i.e. the pH value. It is a base or alkaline, therefore an important “opponent” of acids. Bicarbonate works as an acid buffer. Your body does generate bicarbonate during metabolism, but generally not enough to regulate the acid/base-balance your body needs to function efficiently. Bicarbonate is a natural component of all mineral waters. Mineral waters that are sourced from limestone-rich areas typically have a high bicarbonate content. Bicarbonate plays a vital role in buffering acids and ensures that the mineral water tastes pleasantly clean and refreshing. Mineral water provides a good way to consume bicarbonate. A mineral water can be regarded as containing bicarbonate if it has a bicarbonate content of 600 mg per litre. How much bicarbonate a water provides can be seen on the label of the bottle. With 1,816 mg bicarbonate per litre, Gerolsteiner Sparkling contains a lot of this ingredient; Gerolsteiner Naturell is also regarded as containing bicarbonate with an amount of 577 milligrams. If you want to make a direct comparison, go to the Mineral Calculator, where you can compare nearly 500 internationally available waters. Fill one glass with Gerolsteiner and another glass with tap water. Fill two glasses with 100 ml cola each. Dip a test strip into each glass of water and into one of the glasses of cola for approx. 1 – 3 seconds. Place each strip in front of each glass and read off the scale what pH-value the respective fluids have. 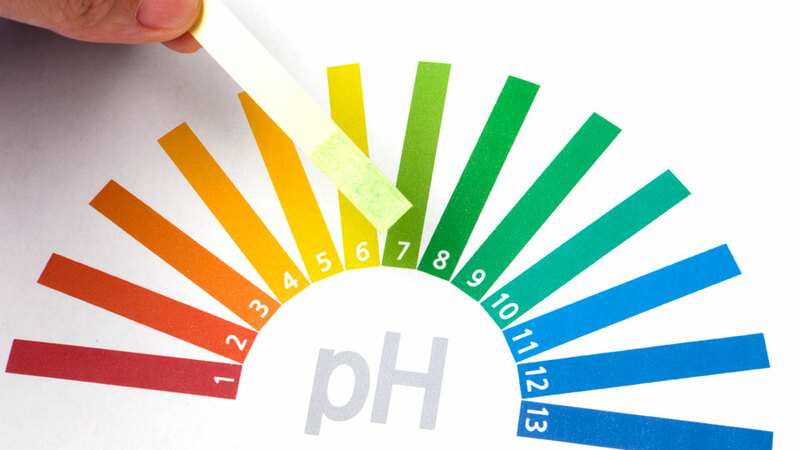 Hold the indicator scale close to each strip so determine pH value. Note down the values. Now for the fun part of the test: pour the Gerolsteiner into one of the glasses of cola and pour the tap water into the other glass of cola. Stir both briefly and then test the pH value again. You’ll notice that the cola that was with tap water now has a somewhat higher pH value of approx. 3.3 - still an acidic value. The cola that was mixed with Gerolsteiner now has a pH value of approx. 5.5. – a significantly reduced acidic level. On average, cola has a pH value of approx. 2.5, tap water approx. 7 and Gerolsteiner approx. 5.7. Gerolsteiner can actually reduce the acidic pH level of soft drinks. With more than 1,800 mg per litre, Gerolsteiner Sparkling Mineral Water contains a large amount of bicarbonate, which not only has an impact on acidic foods and drinks, but also ensures that Gerolsteiner taste clean and refreshing. Have fun with the test!